Barcelona lined-up in the experimental 3-3-4 which had featured for long periods of time of Guardiola’s final season at the Camp Nou. The back 3 consisted of Abidal, Puyol and Mascherano ahead of Valdes in goal. Busquets started in his standard pivot position with Xavi and Thiago left and right of him in central midfield. The wings were occupied by David Villa and Dani Alves whilst Fabregas joined Messi up top in their double false 9 partnership. Meanwhile Osasuna lined up in a 4-4-1-1 formation, given Barcelona’s dominance it was difficult to determine what Osasuna’s game plan was, as it was 5-0 at half time alone. At the start of the game, Osasuna were quite positive in their pressing and applied pressure all the way back to the goalkeeper. This forced Valdes into supporting the development on a few occasions. Through creating this goalkeeper back 4 line, the defensive line can cover more space whilst still being more safely connected against the pressing. By covering the width better it initially makes it more difficult to be pressed against because Osasuna must do more running and they cannot concentrate their press on a specific space. However, this can have downsides in that the distances between the back 3 are too long to safely circulate the ball amongst them. This is because the travel time on longer passes means that Osasuna can adjust their press easier as the ball is circulated at a slower pace. B In addition, the use of Valdes in the back chain of the first phase, allows a better progression through the lines. Since Busquets can stay higher, he adds to the numbers behind Osasuna’s line of pressure alongside Xavi and sometimes Cesc or Tiago. With more passing options in the next line, Osasuna have to be more careful about their press in aspects such as cover shadows, especially if the positional play is well distributed, whilst Barcelona’s back 3 having more options to play into. Alternatively to counteract Osasuna’s early press, Busi could drop into the defensive line to create a back 4, however there would then be no near player on a close second line, meaning that progression upfield would be difficult as it would force a longer pass. Had this longer pass been then intercepted, there would be a more difficult counterpress as the players would be starting further away from the ball, whilst the defence deeper is still unorganised in transition. Therefore, Valdes must support and create the better connections as it is less risky than Busquets dropping. With him in the back line, he facilitates a quicker switch allowing Barcelona to beat Osasuna’s high press. The 3 man defence introduced for many games of the 2010/2011 season was highly resembling of Barcelona’s previous structure in the 1st phase of possession, with Busquets dropping between the centre-backs. Now however, they maintain the 3 men in the defensive line, yet Busi can stay a line higher. With this, development into the 2nd phase is easier as Busi can use his excellent intelligence in midfield to help progress up the pitch as an extra player allowing for greater security in short combinations. As in their 4-3-3 1st phase, the back 3 allows Barcelona to cover the width of the field across the backline, as the central defender can occupy the centre leaving the half spaces and flanks to the outside defenders. This maximises the potential passing lanes into midfield as they have a more efficient distribution of spatial coverage, where they can access different angles very quickly. With a semi-permanent back 3 across the width of the pitch, horizontal circulation becomes much quicker and fluid. With the ability to move the ball horizontally at speed, passing lanes open up much easier as the opposition failed to adjust to the changing of angle in time. From this they could more easily develop play into the 2nd phase through Thiago, Busi and Xavi. On top of this, the team becomes more flexible/versatile in the spaces they can develop into. Wide progressions become more stable and achievable as the wide centre-backs move wider, whilst the relative CM supports in the half space as well as the near false 9 having a free role to drop. Busi makes balancing movements to cover for either wide centre-back, as Abidal supported more expansively than Mascherano. There was also some interesting balancing movements from Alves who took Messi’s position quite often when he dropped into the right half space. Their wide possession was supported by Osasuna’s formation, who used 1 striker, making it 3v1 in the first chain. Given this, Barcelona had 1 surplus player in the back line, meaning the wide centre-back could be more expansive in their positioning and general support when the ball was on their respective half. 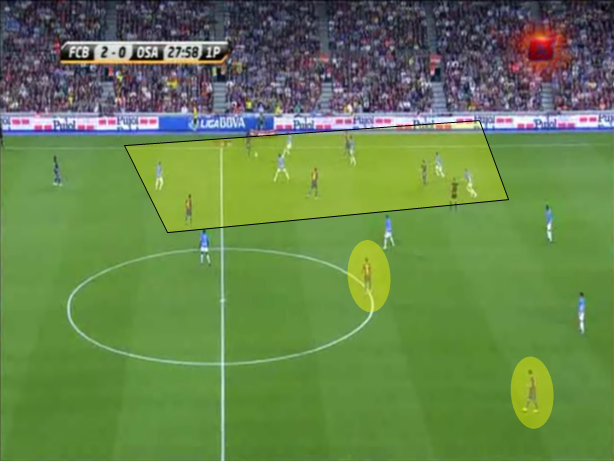 This is a key strength of the 3-man back line in possession, as it conditions a teams who aim to press into a 4-4-2. This leaves their midfield open to central overloads with only 2 central midfielders which obviously Barcelona would’ve exploited easily, especially with this possession structure. If they don’t move into a 4-4-2, such as in this match, the extra defender can support possession from deeper and can allow midfielders to make more aggressive movements by covering the space behind and offering defensive stability in counter-pressing clearances. Osasuna have been conditioned into a relatively compact 4-4-2, blocking the most obvious passing options. However in the 4-4-2, space is available in the half space for Abidal to drive into, without good pressure from Osasuna who are covering passing options instead. By overloading the space between midfield and defence, Barcelona restrict the ability of Osasuna’s midfield to close down, as it would allow a deeper player to find possession in a much more threatening area. With a temporary lack of pressure on Abidal, he has the ability to meet the deeper movements of Cesc and Villa to progress behind the Osasuna midfield line with Xavi moving away to further open the space with the Osasuna player covering Cesc. Alternatively, given the great focus on the left as he moves up to increasingly threat, a switch to Alves is possible, especially given the aforementioned lack of pressure. Xavi and Busquets dropped sometimes to support Barcelona’s 1st phase. This was usually when the possession deeper lacked pace. Their superior passing ability and tactical understanding in this aspect made for a better progression as they could access more difficult passes. However it was a less common occurrence than in the 4-3-3, as their shape allowed the progression from phase 1 to phase 2 quite well. In one situation at 36:30, Busi dropped into the back 3 between Puyol and Abidal. With space created from a central overload to the right, as well as high positioning from the rotated Villa and Fabregas, Busi made a nice vertical dribble into space. The initial attempted overload was initiated by Messi dropping into the right half space then coming inside, forcing Osasuna to flood the area with men. This lead to Busquets being the free man and space opening up on the other side of central midfield. In addition, Fabregas occupied the two right Osasuna players whilst Abidal’s wider positioning allowed an easy through ball had one challenged Busi too quickly. Through this, Busquets developed the attack well into late phase 2 but a poor horizontal pass to Villa slowed the attack down and they decided to relocate the attack instead. Xavi dropped usually when the back 3 became very wide, to slot into a half space creating a situation 4 chain but the positioning wasn’t altered by Xavi’s movement. During these situations, Fabregas would drop into the space left by Xavi, mainly as balancing but also having a direct presence in the build-up also. His support in the left half spaces has multiple benefits. Firstly, he allows the defensive line to cover the entirety of the pitch, whilst maintaining the connection between the players, especially on the left flank. Like I previously stated this improves the circulation of the ball left to right, leading to passing lanes being opened more easier for progression into the midfield. He also supports the developments on the left half of the pitch. He improves the overall passing angles for the team by accompanying Abidal, whose range of movement/passing is cut in half by the sideline. 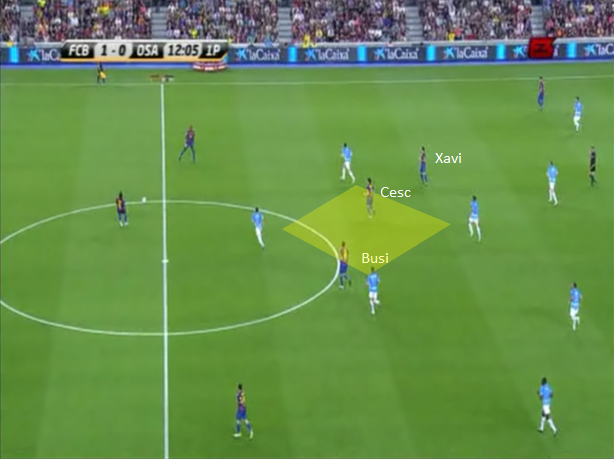 However, being in the half space, Xavi still has 180’ of view which can allow him to access all in front. By pushing Abidal to the touchline, the movement allows Villa to have greater freedom. This is because the French defender is now providing the width instead, meaning he can come off from the touchline and drop into space or move up against the defensive line centrally. This then balances Fabregas’ dropping movement. The space opened up by the back 3 moving wide also gives Xavi some time and space to receive the ball and turn, then possibly pick out a more expansive pass. Especially since Osasuna used man-orientations, the space becomes greater as Abidal dragged the right-winger away from this area. Fabregas also dropped at times very deep to act as the free man in the 1st phase. In these situations he was at times more effective than Xavi dropping because Cesc was more difficult to pick up since he’s moved from effectively a striker’s position. 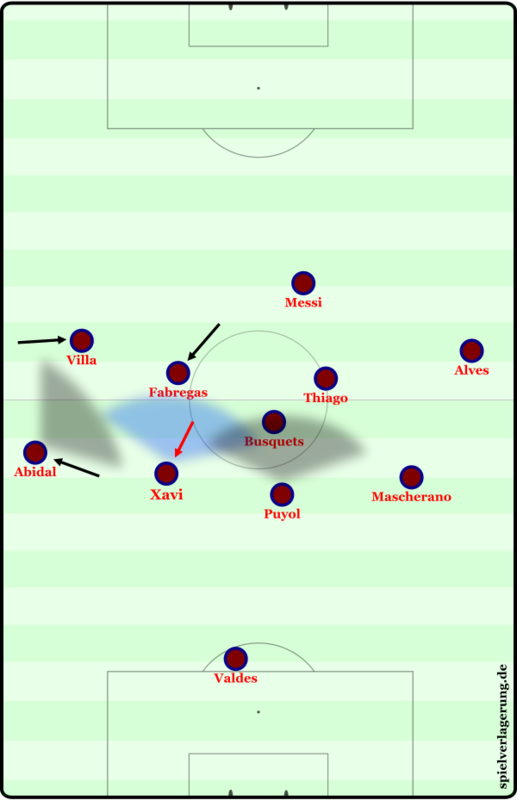 In the game, Barcelona held a tendency to develop down the left flank, especially in comparison to the opposite where Mascherano was much less active in build-up. As stated previously, the +1 rule in the backline meant that Abidal could sometimes move higher and support the developments on the left side of the pitch. By moving vertically as an outside centre-back he often advanced freely where he could create good passing angles to find the likes of Villa and Fabregas behind Osasuna’s midfield. This was supported greatly by Busquets’ balancing movements where he dropped slightly to cover for Abidal’s advancements. 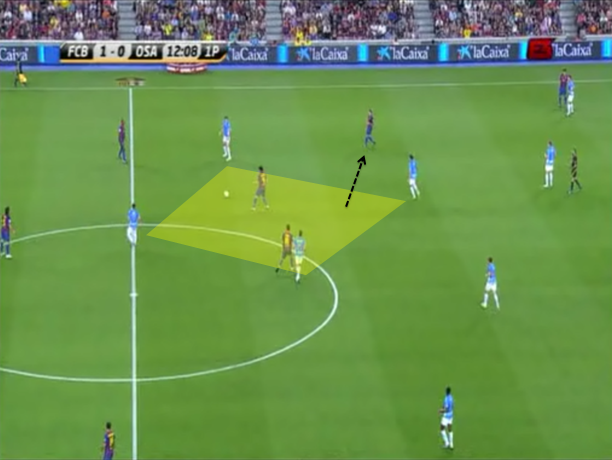 Balancing was an important aspect of Barca’s movement in developing on the left, as the flanks are much more difficult to pass through given they have 180’ of direction to play in – as a result, the availability of multiple passing options is necessary. This can be achieved by balancing, as without it players start to occupy the same zones or lines, as shown below. Villa moves inside (which is a strange decision to begin with, I think. This leaves the touchline uncovered and two players on the 1st inside line, this translates to Villa having no way to influence the game from his position, as he is virtually on the same passing line as another player. Given this, Osasuna could defend it very easily with 3 players concentrated here, resulting in an unusual Barcelona long ball. Higher up the pitch on the left, Villa and Fabregas made some interesting movements. When Abidal moved wide to the touchline, Villa utilised this and Balanced by moving inside against the defensive line. Despite the distance, I still consider this balancing as it ensures that the players occupy different vertical lines to increase the ability of forming a connection whilst making it difficult for Osasuna to disrupt such a pass. This was often in co-operation of Fabregas, who when dropping deep, gave up the space for Villa to move into, temporarily unmarked. At times Cesc even made a simple rotation with Villa yet this was much less common than his involvement in possession in deeper areas. A number of these left developments led to a switch right through Busi or if necessary, a more stable approach in the back 3. This served to create 1v1 situations by shifting quickly to the underloaded side of the pitch, where Dani Alves and sometimes Thiago or Messi were there to exploit the space. There were two main variations of this with obviously many smaller deviations as a result of the overall flexibility. The main two were based around Abidal however, who either sat deeper at the base of the structure, or had a more constant and direct involvement either wider or more advanced. By keeping Abidal at the base of the attacks, Barcelona are more orthodox in possession with more standard rotations of positions such as Villa with Cesc. Less standard rotations involving Abidal are less possible as Abi cannot balance the likes of Villa unless he moves wide in deeper positions, however this reduces his range of movement to half (cut off by the touchline) and doesn’t have an as good effect. However the overloads in midfield are still possible as Cesc comes across to act as the free man amongst Xavi and Villa. Whilst because of the large numbers around Osasuna’s midfield, Abi has space to move into as the opposition struggle to move out an press with fear the space behind will be exploited. You could consider this the more versatile approach, as Busi staying centrally gives the ability to circulate back inside too, which is potentially more difficult when Busi drops to balance the driving forward Abidal. Alternatively, with Busi dropping to allow Abidal higher, it allows a greater focus on combination play and development purely down the left. This is because if you see it as a simple rotation between defence – midfield whilst Busi goes midfield – defence, Barca now have a midfielder more oriented on the left in comparison to Busi who is very central for balance. On the left, Abidal has a range of movements and can balance players to give them greater freedom, probably the most common of this was Villa. As shown in the goal, by advancing forward Abi can occupy the wide line so Villa can come inside in a position more suited to his attacking abilities. In any system, the distribution of space amongst players is vital, the perhaps this is more relevant with Guardiola’s Barcelona with juego de posicion. Although Barcelona are obviously excellent in close spaces, making quick combination plays through defences, in many situations they look to give each other space by keeping their distance. This is more emphasised on 1v1 players, who can isolate their opponent much more easily when they are dejected from the majority. In phase 2 especially, the positioning of higher teammates needs to have good variation both vertically and horizontally. If they vary vertically, the outcomes of different options also vary, so the opposition have multiple different issues they could face, from a longer vertical pass to penetrate a line of defence or nearer combinations to protect the ball through compact areas. On the other hand, horizontal variation increases pass lane options giving the ball-carrier options whilst stretching Osasuna. Similarly it allows for different situations to occur depending on the pass. If the horizontal positions aren’t spread far enough, then 2 or 3 passes may result in a player being in a similar position meaning that Osasuna can prepare for this one situation. As you can see in the above diagram, Busi has options vertically, diagonally and horizontally for passing all of which provoke different reactions from Osasuna. With the distribution of positions nearly all players are connected whilst there is only the case with the left passes where 1 Osasuna player could cut off >1 passing option. Should Barcelona pass to Alves, Osasuna need to stop any passes inside whilst shifting across slightly. Possible combinations inside with Thiago would need to be covered whilst a pressure release ball to Mascherano is possible. The diagonal to Thiago would force Osasuna to retreat but move horizontally also with the ball in the half space. Barcelona’s tempo would increase greatly causing a rhythm change so Osasuna’s defence would have to adapt quickly. The vertical to Messi is slightly unique, as it is a pass to Messi which causes issues in itself. However the main issue would be retreating as the change in tempo would make it difficult for Osasuna’s midfield to recover. A specific example of moving away to support a teammate could be seen in the 12th minute between Xavi (who’s brilliant at this) and Cesc. This situation has been created after a failed attack on the right, Barcelona retreated through the back 3 to switch to the left. Cesc has dropped as the free man yet with Xavi near him he hasn’t got lots of space to use, especially since he lacks the dribbling and speed to function in tighter areas. Recognising this, Xavi moves wide to create more space for Fabregas when he receives possession. Not only this but Xavi is now free for an easy pass where he can move forward unchallenged. With Xavi in a deeper-lying position, supporting the development from the back alongside Busquets, Thiago could orient himself to a more advanced role in relation to positioning. Through this his main role was to help generate superiorities behind Osasuna’s line of midfield, in co-operation with Messi and Fabregas were both supporting in this aspect too. The distribution of roles between midfield can be somewhat shown here, with Xavi and Busi deep whilst Thiago stays higher alongside Fabregas and Messi. In the 2nd phase however, Thiago takes much more involvement in the progressions. His positioning was frequently in the pass lane between Osasuna’s LCM and LM, in the right half space. Through this he allowed his team to move into the 3rd phase in a dangerous position in front of the defence. On top of this, his positioning in the half space supports right-sided attacks by opening up the wing. For example in the below situation, Thiago is available in the passing lane, and can be used by Busquets’ vertical passing. However, if the LM comes across and blocks this option, he allows Dani Alves to be used who would create a 1v1 by isolating the left-back, exploiting individual qualitative superiority. As ever, central overloads were vital in Barcelona’s development. Through the dropping of both Messi and Fabregas to combine with a midfield trio of Busquets, Thiago and Xavi, they facilitated Barcelona’s passing through often compact central areas. 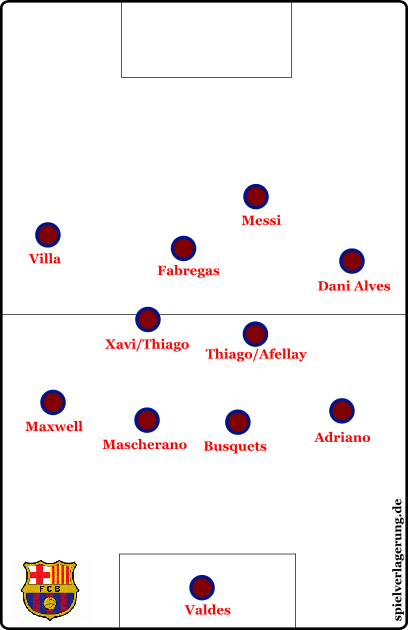 With Villa inside, Barcelona could create such overloads, as shown above. By flooding the left halfspace, a mini-switch can release Fabregas and Messi as Osasuna’s midfield has become completely unbalanced when trying to challenge Xavi in possession. These central overloads often resulted in benefits away from the middle fifth however, as this drew Osasuna very narrow, allowing Villa and more commonly, Alves to break into wide spaces. This created 1v1 situations which benefit the wide players because of their superior ability to Osasuna. Also a key aspect to breaking down a compact block (although Barcelona obviously had little trouble doing this) is breaking it down into 1v1s which are more easily exploited. The high numbers centrally often functioned as a method of protection for the ball, allowing Barcelona to maintain possession despite lacking needle player Iniesta who is important in these situations. For these moments, the dropping of Messi was in particular important, as he has the speed required to act in such tight spaces and created some good moments with Xavi in the first half. On the other hand, Fabregas is less able in tight spaces as he lacks dribbling ability; this is why we saw him making more deeper movements in early possession than support in these moments. A common pattern, especially in the first half was the strategy of overloading the left in development (phases 1 and 2) then switching quickly, towards Alves/+Messi or Thiago on the right to attack the under-covered area of Osasuna’s defence. This had many smaller variations, as the back 3 allowed for a safer and controlled deeper switch yet for more effective results Busi had good positioning to continue the ball on as well as the passing ability of Xavi. In this situation, Barca have been circulating the ball around the left for around 20 seconds through simple combination play with Fabregas and Busi moving over slightly. This has attracted Osasuna pressure meaning that the opposite is rather open. With no-one centrally properly available for a switch, whilst Osasuna are in some good positions to cover inside options and potentially counter, Barcelona switch via the back 3. Thiago reads this and moves further wide near Alves. Through the diagonal pass out to Thiago, Osasuna are unorganised with Thiago having room to move tinto whilst the opposition are ahead of the ball still, such are the benefits of diagonal passing. The now-Bayern player can exploit the small overload in the centre where a 1-2 between Fabregas and Messi results in the second goal. In another case, a similar left-side build-up has created similar shapes. However, in this case Barcelona can more quickly switch through Thiago in the centre, whilst Messi has dropped slightly in the half space to become free. In two passes, Barcelona have created a more threatening situation on the right in a 2v2 with Messi and Alves. In some cases Messi would stay stationary on the right touchline waiting for a pass. In this case (as in many others) The Osasuna midfield is very narrow to contest Barcelona’s central numbers, leaving a 2v1 on the wing. Also notice Alves moving onto an interior line to improve the connection to Messi and balancing the attack. The switches were not always the full length of the field however, as Messi also received many passes in the right channel following left build-up. This was accentuated by Osasuna’s man orientation making off the ball movement such as this more effective when the defence are much more individually-focused on players in the opposite spaces. An example of Barca’s attacks on the left-wing was evident in their 3rd goal. 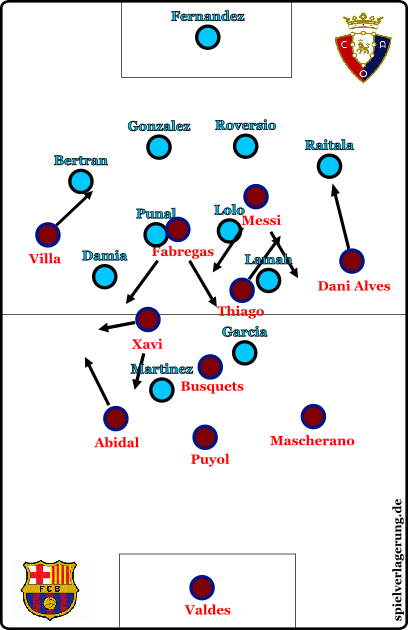 Contrasting to the above, the move started with development on the left, as the Barcelona players shifted across. This right possession which was facilitated by combination play was supported by the movement of Fabregas (highlighted, who shifted all the way across to the right wing, whilst Thiago moved ahead slightly in reaction. Then Xavi utilises his excellent passing to reach Abidal in the left half space. Villa makes inside movement into Fabregas’ usual position, as Thiago dropped attracting the attention of the centre-back. Villa is supported in this by the advancement of Abidal as he moves wide to maintain the width that Villa abandoned providing. This can be related directly to a later topic: the playing philosophy of juego de posicion. 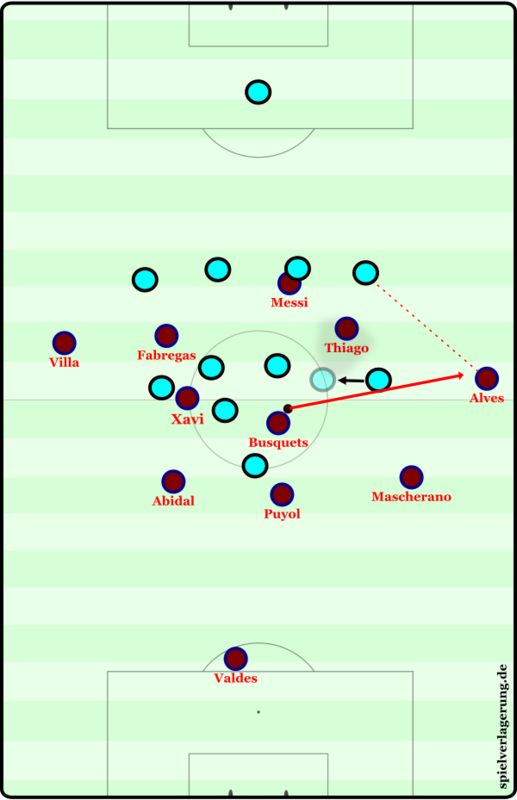 There were some more simple rotations of positions in Barcelona attacks, with Xavi and Messi often rotating a la their 4-3-3 formation with a false 9. I think such rotations were a result of the necessity to balance, stopping the shape becoming unbalanced for example with Busi dropping for Abidal. However the main benefit in this context was how it allowed players of different abilities to function in different areas to those with alternative. A prime aspect of this was the rotation/balancing of Fabregas and Villa. By rotating between LW and LST, Fabregas could support in the possession play on the left, which he is more able at doing than Villa, whilst Villa can come inside and act as a more of a direct striker, utilising the abilities such as movement behind and finishing which Cesc doesn’t have. 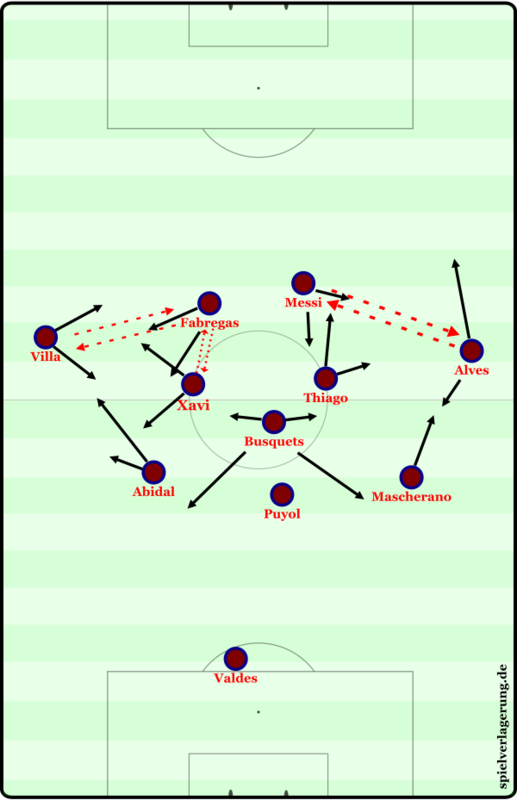 This helped Barcelona become less predictable, since Osasuna weren’t facing the same players in the same positions, which wouldn’t have exactly become repetitive given the nature of Barcelona’s system, however it would’ve required similar responses. However the response to Dani Alves on the wing is different to how they should react to facing Messi on the touchline. The counterpressing of Guardiola’s Barcelona was significantly under-acknowledged. As Cruyff explains above, they had excellent counter-pressing ability as a result of their possession beforehand. Short passing means than numbers are always going to be close to the ball so when the ball is lost, large numbers are on hand to counterpress to regain possession immediately. 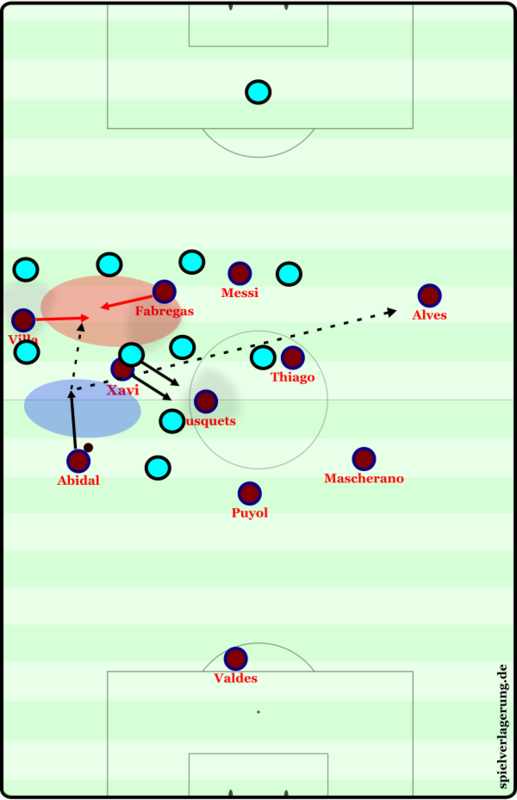 Specifically Barcelona used passlane oriented counter-pressing. Upon losing the ball, Barcelona look to press every pass option so to block off any passes to escape pressure, whilst obviously moving towards the ball-carrier. Through this they aim to regain possession on the first pass of the opposition but can also press the recipient of the pass easily. In the second half, Barcelona changed to a 4-3-3 system which was more resembling of a 4-2-3-1 than their usual 4-1-2-3. One of the many interesting aspects of the system was the defensive line, which was based largely around the positioning of Busquets. In possession, Busi would step up from the defensive line and often join midfield situationally however in defence he largely remained in a back 3. This variation brought stability off of the ball, whilst maintained the benefits of a back 3 with it, it was likely with the game won, Guardiola looked to experiment to explore possible variations of his side which would further improve them, such is his nature. Interestingly, the front two’s movements changed come the second half. Whereas in the first half Messi made movements down the right for switches in the first half, he was more oriented to the left half space in the second. Fabregas on the other hand, made many more movements to the right, as he looked to support the developments on that flank instead. Instead of involving himself in combination play in tight spaces, Cesc instead looked to drop into bigger spaces as Osasuna tired leaving them less capable of maintaining a vertically-compact shape. This was then exploited by longer vertical passes from deeper positions by the likes of Busquets. In these moments he acted often as the free man, similarly to developments on the left in the first half, almost taking over Thiago’s role in balance as he moved inside to support possession more. Seemingly Guardiola had influence this, as he may have wanted to see his team concentrate on penetrating different zones to accompany the change in overall shape, as the right side was less often used in developments in the first half. This in particular was a result of the back 3, where Mascherano didn’t support as much as Abidal, however the change in defensive line resulted in a more balanced approach. After Xavi came off, Thiago adapted into his role in a deeper position, far from his higher position in the first half. This was simply as a necessity for support in bringing the ball out from defence, and was supported by the full-backs inside positioning at times and obviously Busi moving up. Obviously he fell slightly short of Xavi’s impeccable standards, yet the now-Bayern midfielder facilitated the change in shape and introduction of Afellay, who then adopted Thiago’s previous position. With more balancing movements to the front 2, Afellay allowed Fabregas greater freedom in the short period of time that he was on the field. More influence from Fabregas allowed Barcelona to reduce the impacts of their removal of one midfielder (on paper) and this factor, as well as Busquets’ and the full-backs positioning led to Barcelona exercising similar levels of dominance. One could argue that talk of dominance is redundant given the scoreline, yet remember Pep was likely experimenting for future matches in testing alternative shapes – something he must do not only in practice but in matches too. *For additional reading on the philosophy of Juego de Posicion, check out AO’s article on the subject here, whilst RM also wrote on the matter here. A significant aspect of Barcelona’s juego de posicion, is their emphasis on obtaining superiority through creating numerical dominance in all situations. This is achieved through the flexibility of the system allowing nearly all players the freedom to move into alternative areas. A prime example of this was in the roles of Messi and Fabregas, who dropped from their striker position to support the midfield, creating overloads easily. One of the key aspects of utilising numerical superiorities is by finding the free man. One case of this in the match was in the back line, where it was 4 Barcelona players against 2/3 Osasuna. With less players in the area than Barcelona, they obviously couldn’t cover every player inevitably leaving some free for a pass. If these free players are in dangerous positions (which should be their intentions) then they can break opposition lines and create under less pressure. Through overloading a specific area of the pitch, Barcelona can carry the ball through this area by utilising combination play between the large numbers. This translates almost seamlessly to the rondo practices, as in situations like 5v2, they’re utilising similar (though slightly exaggerated) numerical superiorities which they would find in a game situation. In addition, the superiority in numbers supports improved counterpressing, meaning that if lost, possession is likely to be regained within 5 seconds. If there are high numbers of Barcelona players around the ball, there are more players to block pass-lanes and press the ball-carrier – with higher pressure on the opposition, there is obviously a greater chance of regaining the ball. Numerical superiority can also be used to create alternative attacking routes. 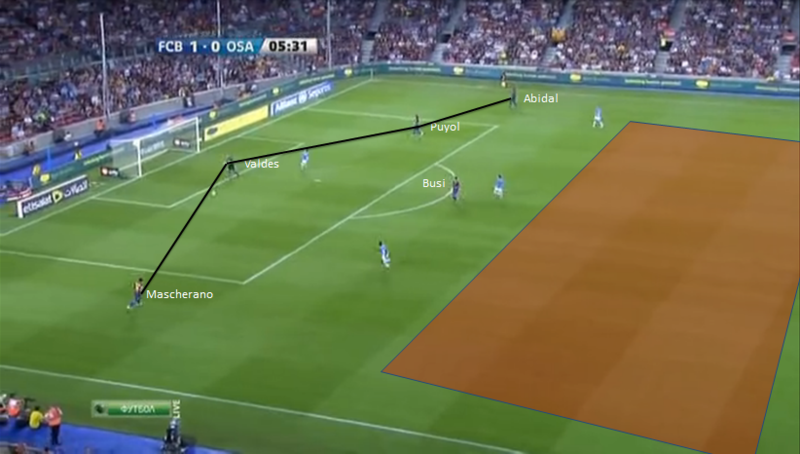 As I discussed when covering Barcelona’s attacking strategy through switching, they overloaded the left of the pitch, dragging Osasuna in, then switching the ball to the right, which was left open by the opposition. This causes huge dilemmas for the opponent, if they try to not become too compact horizontally, then Barcelona can easily play through overloaded areas, however if they become narrower to counteract this, then they’re more susceptible to these switches. Although lesser used than numerical superiorities, Barcelona looked to beat the opponent through emphasising the greater quality of players. This is most commonly done in 1v1 situations, as the result has less variables (presence of supporting defenders) alternative to the individual abilities of players, meaning that it is more likely to be effective. Given this, we can link quite closely the two methods of superiority, as they can often use numerical advantages to create situations to exploit qualitative superiorities, such as in freeing Alves on the uncovered right. The most common situations in which this occurred was through Alves and Messi. As previously stated, Alves was used following overloads to create 1v1 situations. On the other hand, Messi often withdrew from his striker position to drop into gaps where he could directly attack an individual defender. In addition, a trigger movement for these situations is for nearby players to move away. Against the man-orientations of Osasuna, this dragged supporting defenders away to emphasise the 1v1 battle. An example of this can be seen above. This is quite simple in that Dani Alves withdraws from the attack and takes up a deep position, allowing Messi more space to work the 1v1 following a switch. 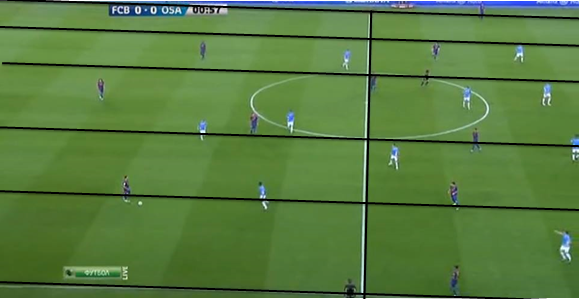 The positional play of Barcelona occurs on the above grid, designed by Guardiola. In juego de posicion, the pitch is divided into zones through these lines, on which the players must position themselves in orientation to the ball’s position. Given this ball-orientation, the lines which must be occupied vary are dependent on which area the ball is in – if it was wide then the positions which need to be occupied would be different to if it was deep and central. There is a specific emphasis on the four central vertical lines, which are the most important to Guardiola’s philosophy. In this situation, we can see the deeper players oriented on the vertical lines, whilst every single player ahead of the ball is oriented on a vertical or horizontal line across the pitch. As expected, the strictness of the positioning decreases the greater the distance from the ball, as it is less necessary – we can see Thiago and Fabregas both slightly off of the vertical lines. Secondly, in this scene Barcelona are in phase 3, and have players oriented on every vertical line, with a greater focus centrally. In some cases there are 2 on a vertical line but never more, abiding by the rules so that the attack is well balanced structurally. 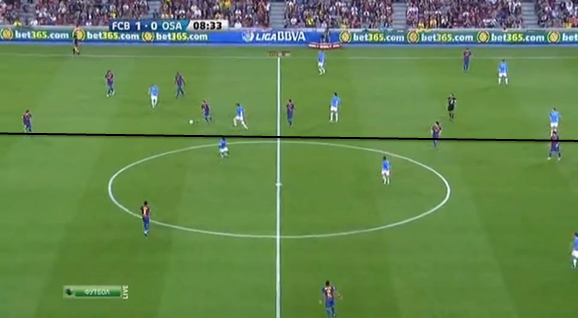 In this example, the cases of 2 players on 1 line are necessary, as Busquets (furthest left on image) is there to facilitate horizontal circulation of the ball ahead of Osasuna’s defence – allowing Barcelona to change the angle of attack and force shifts, where potential lanes could open. Finally, this scene depicts the positional play in action quite well. No more than two players should be on the same vertical line, however there are 4 here (on the interior left). As this is realised, the players start sprinting away in order to restructure the positional shape, restoring the necessary balance to circulate the ball effectively. In other teams, such structural imbalances would likely not be recognised, resulting in a much more difficult ball circulation and possession play in general. Since Guardiola left, Barcelona’s positional play has declined significantly, which is one reason as to why they have not been able to reach similar levels of performance as their possession game has struggled in comparison. Top quality article on spielverlagerung as always. I like the whole retro analysis idea it’s great. I’ve always thought about numerical superiority vs. individual superiority and concluded that numerical superiority is more tactical whereas individual superiority is something that players should exploit. However it’s interesting to see how managers use both in conjunction (e.g numerical advantage in midfield to isolate players 1v1 out wide). Again as always great read! Please do more like this, and for more recent and tighter games. This is absolute gold. So many insights. Understanding the genius of Pep in Barcelona is always fascinating.